Nine Navies War begins at the start of 1915, after a victorious Germany has overrun France the year before. (Perhaps the BEF didn’t land on time or at all, or they got bottled up in Mons, or the Germans kept to their full-blown, keep the right super-strong and pull back on the left Schlieffen Plan scheme, thereby bagging two French armies in the Rhineland, etc.) Italy, seeing the German victory train leaving the station, joins the Central Powers, as do Spain and Greece. All of which makes for a dreadnought showdown in the Mediterranean, Atlantic Ocean and North Seas, as the avidly Mahanist Kaiser Wilhelm seeks to finally defeat the Royal Navy and thus make Germany into a true global power. It will be the battleships of Britain, Russia and ‘Free France’ versus those of Germany, Italy, Turkey, Austria-Hungary and the captured portion of the divided French fleet. 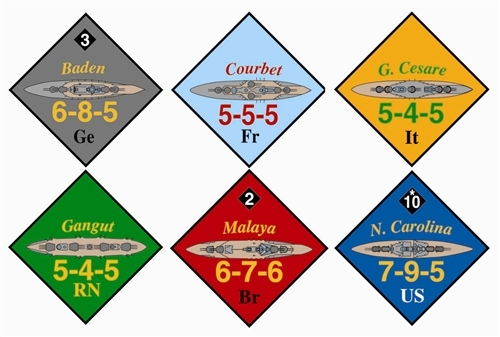 (Each French ship is rolled for at the start of every game. Each can be scuttled, go over to the British, or be captured by the Germans.) There will also be the possibility of later US entry when/if the Japanese switch sides in the Pacific and launch a dastardly surprise attack that finally draws in the Yanks. 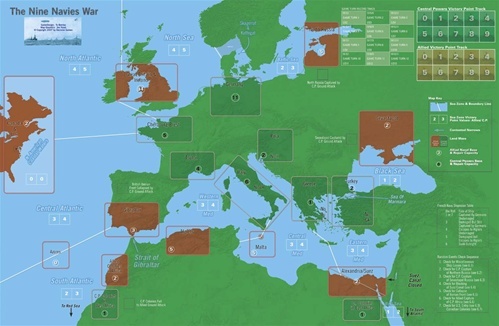 Victory is determined on victory points awarded for controlling the various sea zones around Europe. The geography thereby creates a kind of “two front war,” one in the Mediterranean and one in the Atlantic. The Central Powers player is also able to win a “sudden death” victory by controlling the waters immediately surrounding the British Isles for one full year (three turns). If he does so, the British have just been starved into submission. All the battleships and battle cruisers afloat during that era, along with three late-game British aircraft carriers, are represented in the various nations’ orders of battle, as well as ships that were scheduled to be completed during 1919 if the war had gone on that long. Random events account for the larger developments taking place in the ground war still going on in Russia, the Middle East and colonial Africa, as well as accounting for capital ship losses due to mines, unexplained internal explosions, as well as submarine, coastal artillery and land based aircraft attack. A top of the line German battleship like the Baden has factors (attack-defense-maximum speed) of 6-8-5, while the British battle cruiser Tiger is a 4-4-7. Top-down, full-color, historic ship icons identify every ship. 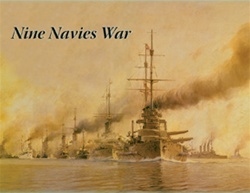 The game uses a derivation of the classic Avalon Hill War at Sea. 9NW is simple two-player game with a short three-turn “1915” scenario, which can easily be finished in one sitting, as well as a 12-turn “campaign game” that will require about eight hours to play.